Gerard Kuiper was a Dutch-born American astronomer and graduate of the University of Leiden, who worked at the Yerkes Observatory and later at the McDonald Observatory. His name rhymes with 'viper.' 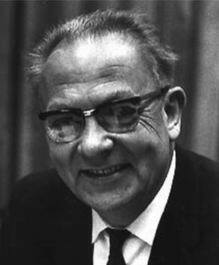 Early in his career, Kuiper studied binary star and multiple star systems. His observations led him to conclude in 1935 that the average separation between the components of binary stars was about 20 AU, which is similar to the distance of the gas giants from the Sun. Following renewed difficulties with the catastrophic hypothesis of planetary formation, Kuiper speculated in 1951 that "it almost looks as though the solar system is a degenerate double star, in which the second mass did not condense into a single star but was spread out – and formed the planets and comets." Extrapolating from the fact that about 10% of binaries contained companion stars that were one-tenth or less as massive as the primaries, Kuiper suggested there might be 100 billion planetary systems in our Galaxy alone. 1. Kuiper, Gerard P. The Atmospheres of the Earth and Planets, rev. ed. Chicago: University of Chicago Press (1952).